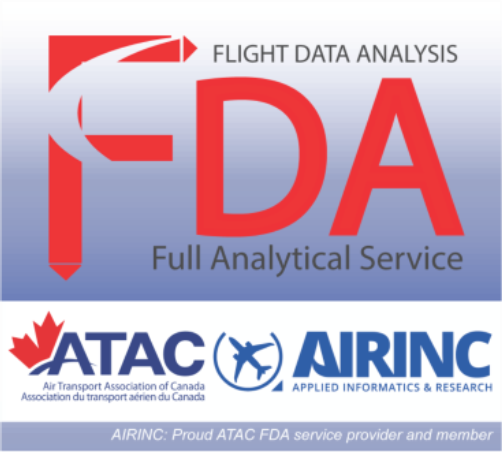 ATAC and AIRINC announces Memorandum of Understanding to provide Flight Data Monitoring services to ATAC members | Applied Informatics and Research Inc.
Ottawa, July 2018: The Air Transport Association of Canada (ATAC) and Applied Informatics and Research Inc. (AIRINC) announced today that they have agreed to a Memorandum of Understanding to provide Flight Data Monitoring (FDM/FDA/FOQA) services to ATAC members and provide FDM support throughout the year but with an added focus during the Annual ATAC Conferences, this year taking place in Vancouver on November 13-15. ATAC’s mission is to support their members in their commitment to a safe, world leading and sustainable Canadian air transport industry. By partnering with AIRINC they will be able to offer their membership access to a Canadian flight data monitoring program with the ability to have common available resourced service sets at preferred pricing and exchange best practices within their member organizations. This agreement will allow for AIRINC to build upon the approximately 275 Canadian registered commercial aircraft that it currently provides monitoring services to. “ATAC is very pleased that we have entered into this long-term agreement with AIRINC and we look forward to providing these preferred services to our existing and future ATAC members with a capability that meets the mandate of ATAC which is to promote member access to best practices especially as it relates to safety. AIRINC is a well-established and trusted partner to the Canadian Industry and with this partnership we will advance these service offering.” Safety focused members of our industry are well aware of the vital and growing role that flight operations data analytics is playing within the aviation industry and with upcoming further announcements AIRINC is positioning itself to provide expanded Flight Data Monitoring capabilities. This is a made in Canada Solution by Canadians for Canadians and I trust that the industry will come together to support these critical opportunities in the interest of Safety and Operational Efficiency. ATAC’s Mission is to support their members in their commitment to a safe, world-leading and sustainable Canadian air transport industry and to promote safe, reliable, efficient and affordable air transportation of people and goods to the benefit of Canadian society. Additionally, ATAC amongst other activities seeks to provide excellent and cost-effective services to their members.